Are you thinking of upgrading your kitchen? Whether you go for a major kitchen redesign or an economy makeover, it’s often the little finishing touches that can make all the difference. From warm and welcoming traditional kitchens to sleek, contemporary urban kitchen spaces, displaying just the right kitchen gadgets plays a big part in perfecting the style you are after. When seeking out little details to put the finishing touches to your new kitchen, take a look at these 7 classic designs that have stood the test of time. Thanks to 2 Belgian industrialists, Octave Aubecq and Armand Desaegher, the French company Le Creuset has been making premium cast iron enamelled cookware for nearly 100 years. So loved and long lasting are the original ‘cocotte’ casserole dishes and subsequent range of ovenware that Le Creuset has found its way into most British households, often as wedding gifts. Perhaps your mother or grandmother owns a piece of Le Creuset? Best known in vibrant orange, there’s now a wide range of fabulous colours on offer. Why not carry on the family tradition? The iconic design of a SMEG fridge will add a retro feel to any kitchen. These distinctive freestanding fridges and fridge freezers have been manufactured in Italy since the 1950s and they come in a vast array of wonderful colours to complement any kitchen scheme. Tastefully elegant but incredibly unique, these appliances are as useful as they are beautiful and they simply won’t date! Check out special editions such as the colourfully ornate Dolce & Gabbana collection, the MG Special Edition in British Racing Green and more. Mason Cash has a history going back over 200 years and a pottery in the village of Church Gresley near Burton-on-Trent in the heart of the English ceramics industry. The iconic British brand is best known for its earthenware mixing bowls and pudding bowls, with the design featuring intricate bas-reliefs on the outside of the bowl that has barely changed in more than 100 years. Loved by home cooks and professional bakers, the Mason Cash Mixing Bowl is a classic piece of kitchenware that no traditional kitchen should be without. 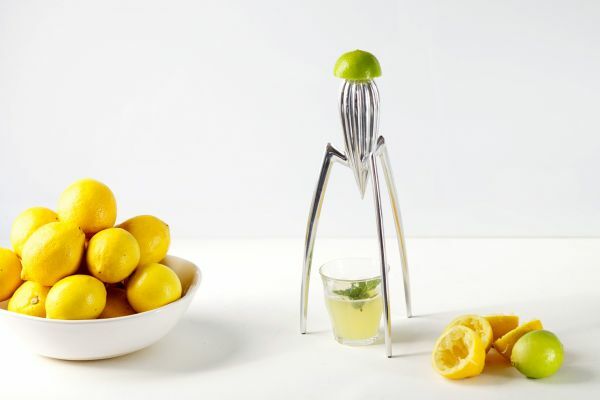 A true 1990s classic, this Lemon Juicer was designed by the well-known French product designer Philippe Starck, allegedly on the back of a pizza napkin. This important object is regarded as an icon of industrial design and has even found its way into the New York Museum of Modern Art! Made by the Italian kitchen utensil manufacturer Alessi, the citrus press is the perfect fusion of innovative postmodernist design and simple functionality in a visually striking object. Use it to press, turn and squeeze the juice into the glass placed underneath, or simply display for all to see. Herbert Johnson was an employee of the Hobart Company and is widely credited with the invention of the electric mixer. His KitchenAid Stand Mixer was launched in the USA in 1918 as a domestic appliance after early incarnations had been used by the US Navy. The mixer design is as popular now as it was back in the day, with global sales now exceeding a staggering $20 million per year. Loved by home cooks and professional chefs alike, it’s an iconic kitchen staple that will look fantastic in any kitchen and is well worth investing in. A Dutch company founded in 1919, Brabantia made their first solid range of pedal bins in 1955 and have never looked back. Timeless and with superb functionality, these kitchen bins are meant to be on show, not hidden away. Recognisable in kitchens around the world, the iconic steel Push Bin is a classic pedal kitchen bin design that is hard to beat both in terms of quality or style. Invented in 1952, the Dualit Toaster was the brainchild of German born Max Gort-Barten CBE, an entrepreneur who had settled in the UK before World War II and fought in the British Army. The principles of his classic patented toaster design, the first ever 6-slice toaster with a built-in-timer, have remained virtually unchanged since the humble beginnings. The Dualit Toaster has been a ‘must have’ kitchen appliance since the 1980s, and makes a powerful style statement in many kitchens and breakfast rooms today.